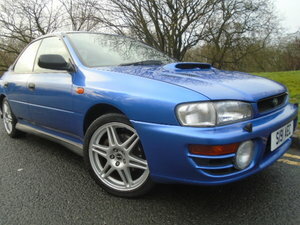 Possibly one of the best future investment modern Subaru Impreza’s on the market. The RB320 ticks every box for becoming a future classic, and is hotly tipped. RB = Richard Burns, this being a tribute to the late former WRC champion who sadly passed away in 2005. 320 = both the production run number and the power output (in PS which equates to 316bhp). Original booklets within original leather wallet. Fantastic condition interior with the optional half leather/alacantara seats. 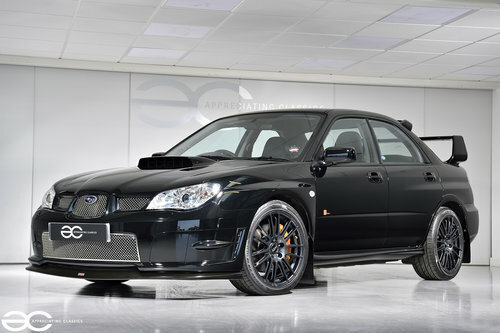 Prodrive really went above and beyond when creating this limited edition, tribute to Richard Burns, which of course they had to. Being available in Obsidian black, with Dark Anthracite alloy wheels only – the RB320 stands out from the crowd and is instantly identifiable as an RB320 among any variety of Suabru’s. RB320 number 123 of 320 was purchased new, on the 18th of July 2007. The original purchase invoice is present, stating a total purchase price of £31,000.00 including the option of Leather and Alacantara seat upgrade. From July 2007 to August 2016 the car remained with the original owner, and has been with the second owner from August 2016 to present. V5 correctly states just one previous owner from new. Within the history file are various receipts and invoices, as well as all the original booklets, retained within the original leather Subaru wallet. Of course, the spare key is present, as is the original RB320 brochure. The service and MOT history are as below and fully warrant the low mileage of just 20,800 miles from new. 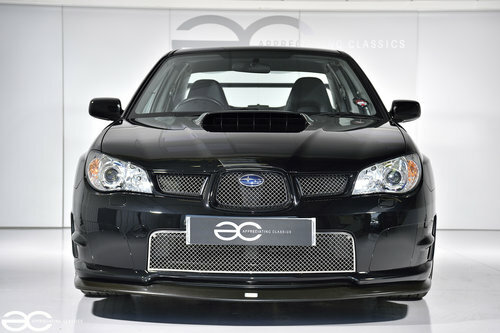 Arguably one of the most aggressive looking Subaru Impreza’s from the factory….. The RB320 was not only a very limited edition, it was also only available in Obsidian black, with Dark Anthracite 18&#8243; alloy wheels. 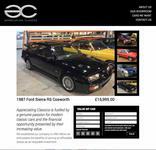 This example is still wearing the original paintwork, as you would expect from such a low mileage and low owner vehicle. We have also had a two stage enhancement (machine polish) carried out professionally and the paintwork/car looks absolutely fantastic – none of the usual cleaning marks/swirls in the paintwork. The finish must be seen to be appreciated, this is far from your average example, and is worthy of any showroom or collection display. All original RB320 decals are still in place, which are all still nice and bright without the usual fading. Again, the wheels are the correct original wheels which are all without any damage and the RB320 mudflaps are in place. No modifications have been carried out, so this RB320 presents exactly as Subaru intended. As per the rest of the car, the interior is also in superb order throughout. The optional upgrade Alacantara / Leather seats are still in great condition, with no signs of any wear. Likewise, the steering wheel, pedal rubbers, and RB320 specific gear knob are all look great. 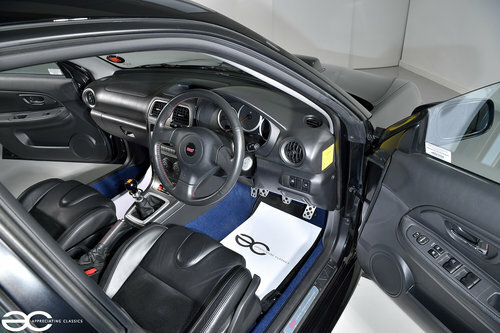 Everything works just as it should do of course, and the original RB320 floor mats are still present and present well. The optional upgrade seats from new, cost £1,276.60 (excl vat) and really do give much more of a premium feel to the interior. With many japanese performance cars of this era having quite a basic interior, the RB320 does not let you forget that you are driving something special, with the seats, gear knob, and floor mats, all displaying the bright RB320 logo (the colour being a nod to the late Richard Burns famous helmet colour). 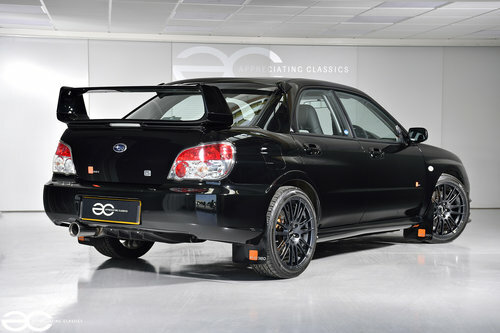 The RB320 had to step up to the plate, especially with the name Richard Burns attached to it. And it delivers very well indeed, with 316bhp (320ps) on tap, the RB320 gives great performance even by today’s standards! 0-60mph in 4.8 seconds, and a top speed of almost 160mph, it is certainly not for the faint hearted. Mix in to this, the superb handling characteristics, the RB320 is a hugely capable car from point A to B. Turn the key and the car fires in to life, meaningfully fires in to life. No unwanted engine noises, just a nice tone from the exhaust, giving a hint at what lays beneth the bonnet. No smoking at all, and once on the move the engine performance is great, with smooth acceleration through the rev range with no hesitations. Likewise, no smoking at all, either on start up, on boost or indeed on overrun. All running gear is in very good order and this car is an absolute pleasure to drive. All wheels are without damage, and have matching premium brand tyres fitted. When on the road, the braking performance is superb and straight, all discs and pads are in good order – and of course the original gold Brembo brake calipers are without any of the usual lacquer peel. 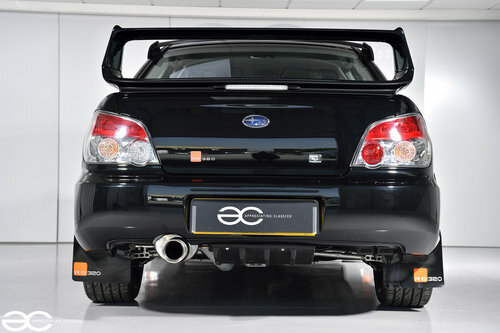 The gearbox is a pleasure to operate, as is usually the case with a Subaru, a lovely tight and direct gear change comes standard and the RB320 is no exception, with it having a short shift fitted as standard. The original Bilstein shock absorbers help offer superb handling, and of course are without any unwanted noises at all. Also, the correct adjustable rear anti roll bar is still in place.